Across the education sector, we define what students need to know and should be able to do for succeeding in college and career. We know that they need more than just the ability read and write — today’s constantly changing workforce shows that they must be able to master academic content, communicate and collaborate effectively, think critically, and become life-long learners. Supporting students as they develop these skills, understandings, and mindsets often requires a shift in how we think about classroom learning and the competencies needed by teachers to facilitate that learning. What does this type of learning look like in practice? 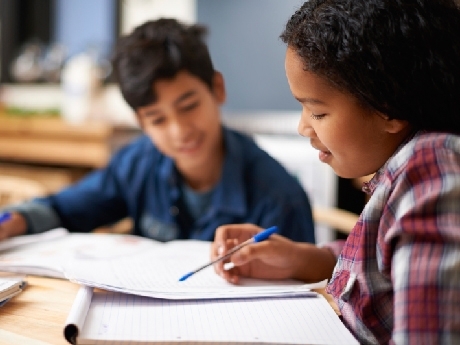 Educators across the country are using the deeper learning framework, developed by The William and Flora Hewlett Foundation, in their classrooms. Through design thinking challenges, project-based learning activities, Genius Hours, and more, teachers can ensure that students are engaged, motivated to persist, and developing key skills. For example, students in a sixth grade robotics classroom might build controllers for swimming robots. One group experiments with settings to sink the robots by filling a bladder with water. Another works to perfect the speed controls on the motor. Yet another tests the robot design to ensure that it can easily move through the water. Students are engaged and focused as they apply math, engineering, and science knowledge to their work. These students are engaged in the six categories of Deeper Learning skillsdescribed below.